Majority of the whitening toothpastes in the market contain abrasive particles or they use chemical agents to bleach. 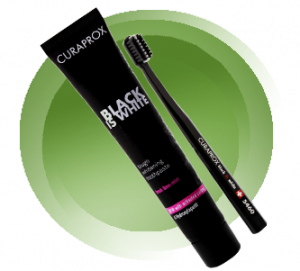 Curaprox Black is white, with its refreshingly lemon-mint flavor, removes discolouration using activated carbon. Activated carbon gives the toothpaste both its colour and its name. It makes the toothpaste pitch black, yet keeps your teeth sparkly and pearly-white. Its enzymes even boost oral health. These enzymes support salivary functions which enhances antibacterial and antiviral function to prevent tooth decay and to help combat dry mouth. All this without Sodium lauryl Sulphate which the oral mucusa hates and it doesn’t contain triclosan. It’s good for your teeth. Hydroxylapatite hardens tooth enamel more effectively and has a protective effect. Fluoride which is commonly found in majority of the toothpaste only makes the enamel acid-stable. Unlike Fluoride, Hydroxylapatite serves as a protective layer on the tooth and can remedy damaged tooth enamel by filling incipient cavities again. Black is White is an affordable, safe and effective whitening agent with double protection against tooth decay. It makes your teeth glow with pearlescence.